The Choice: Flared Hair or the Bullet Head? And there are good arguments supporting each type of head. Making the Choice...Which One Should You Use? The best argument for the flared-hair head is that it's tough—the hair is secured at the hook and free at its ends, so trout teeth, or anything else that might tear the hairs out, simply pass through leaving the hair intact and the head unharmed. The best argument for the bullet head is that it's a quick cinch to tie compared with the flared-hair head. Yes, the bullet is the more fragile of the two, but if made right, it's tough enough. 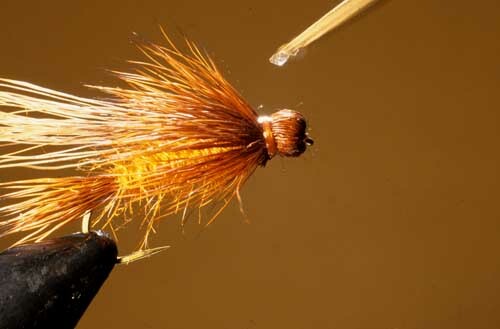 The key to making a bullet head right is to make it out of the right hair—elk, not deer. Most tiers probably turn to deer without thinking whenever buoyant pocketed hair is called for, but deer is soft and somewhat fragile; elk is stiff and tough. The point is, if your bullet heads have quickly shredded in the past, they were probably made of deer—in the future, make them of elk. 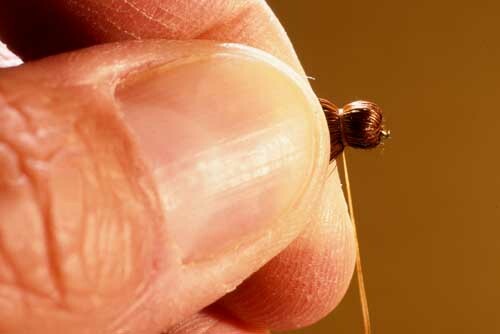 Another concern is choice of thread—you'll need strong thread to tightly bind the elk and flare its tips. I suggest you use at least 3/0, and I wouldn't hesitate to use size-A rod-winding thread or flat waxed nylon on a big fly. The Bullet Head's Hairtips...Legs or Wings? The hair-tips of most bullet heads flare out to suggest insect-legs. Some tiers trim away the hairs from the underside to expose the body and, perhaps, to make the leg-effect more distinct. 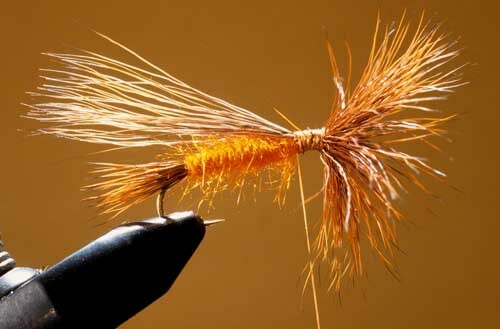 But as with all aspects of tying flies, bullet heads have their variations. The Madam X for example: its head is kept entirely atop the hook so that the hair-tips form not legs, but a wing. 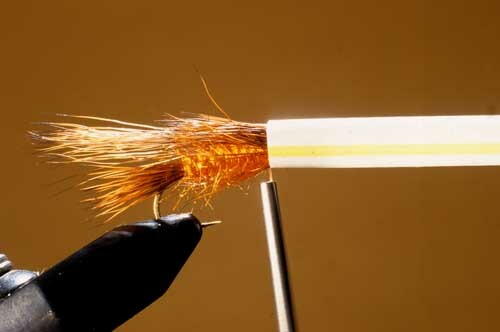 The legs are formed of rubber-strand, bound at the sides of the thread collar securing the head. The Goldenrod and Salmonrod, stonefly imitations developed by my friend Rod Robinson, have short hair-tips, short enough to lie neatly down at the sides. as with the Madam X, with rubber-strand bound at the sides. "Of course I changed the body a little..."
"You can see I used olive synthetic dubbing and a rib instead of the orginal body." There is nothing whatsoever wrong with this. So the bullet head becomes yet another option for the tier. 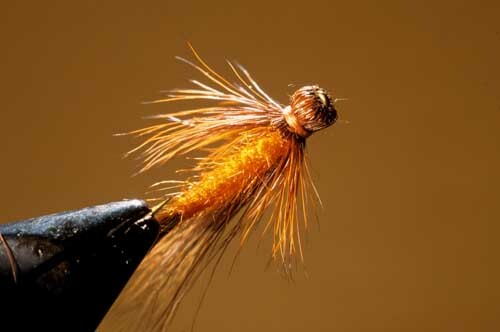 He can—and will—find a way to add it to the Sofa Pillow, the Elk Hair Caddis, and whatever fly he suspects may be improved by it; or, of course, to whatever fly he thinks he'll have fun changing—fly tiers are far less concerned on the whole with utility, I've found, than with fun. But the sensible use of the bullet head is on flies that imitate insects with large heads—most notably, the stonefly and the grasshopper. Many fly patterns that imitate these two insects have bullet heads. But many don't; which means, of course, that they could. Why not a Joe's Hopper with a bullet head? a Jughead with a bullet head? So the bullet head makes sense on imitations of big-headed insects; but since lots of flies are "attractors," flies that imitate nothing in particular, the bullet head has a lot of other potential uses. And, of course, there are a lot of fine fly patterns in which a bullet head was included from the start. 1. 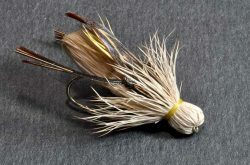 Complete all other parts of the fly except for the bullet head (it usually comes last); leave about one quarter of the hook's shank behind the hook's eye for the bullet head. Trim a modest-size bunch of elk hair from the hide, comb the short hairs and fuzz from the bunch, and then stack the bunch in a hair stacker. Trim the butts of the hair straight across. Work the butts down around the shank or push them straight back around the eye; either way, the edge of the hair-butts should be at the front of the body and the shank should be in their center. Take two turns of thread around the butts, hold the butts firmly in place, and pull the turns tight. Continue adding tight thread-turns to bind most of the hair butts. Trim any long elusive hairs away. Wind the thread back to the front of the body. 2. Push your finger straight towards the eye—the result will be that the hair flares out from the eye, each hair to its respective side. 4. Wind two turns of thread around the hair and pull the turns tight. Add several more tight turns and then whip finish and trim the thread. 5. Add head cement to the whip finish. 6. 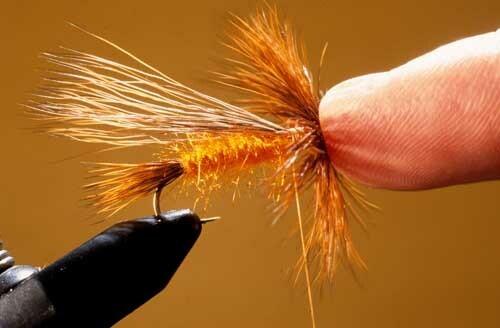 Some tiers prefer to trim away the hair-tips beneath the fly in order to expose more of the body, as shown here. ...and that is how you tie the bullet head.